Since Linux doesn't have PLAYERUNKNOWN'S BATTLEGROUNDS, I'm always on the look out for something like it. Go 4 The Kill [Official Site] is a rather fun attempt to turn CS:GO into a PUBG-like game. I've actually had this on my radar for a few months, as it was emailed in by a reader but I just couldn't get it to work so I put it on the back-burner. Today, I attempted it again and to my surprise—it works! It's a server-side mod, which makes use of MOTD popups for various UI elements like your inventory, map and so on. It's a little clunky, like the mouse sometimes not appearing, but it does actually work okay overall. The map is a lot bigger than what you would expect too (considering this is CS:GO we're talking about), with it being split into sections and thanks to that it performs really quite well. Firstly, I do recommend manually downloading the required files I found on the official reddit. It was actually missing a required file, so I spoke to the developer today who has now fixed it. Once done, load up CS:GO and also load the official Go 4 The Kill website. For it to work, you do need to sign into Steam on the site and then it will give you the option in the bottom left to queue up. When ready, you get a notification and a box to accept which then presents you with the connection command to do it manually, or a handy button to hopefully just do it for you—which worked fine for me! Very impressive work and surprisingly good fun, once you get past the initial waiting around for a game…I hope they keep working on this, as it could turn into something truly beautiful with enough time. I'm always surprised by what modders are able to do and this is seriously clever. 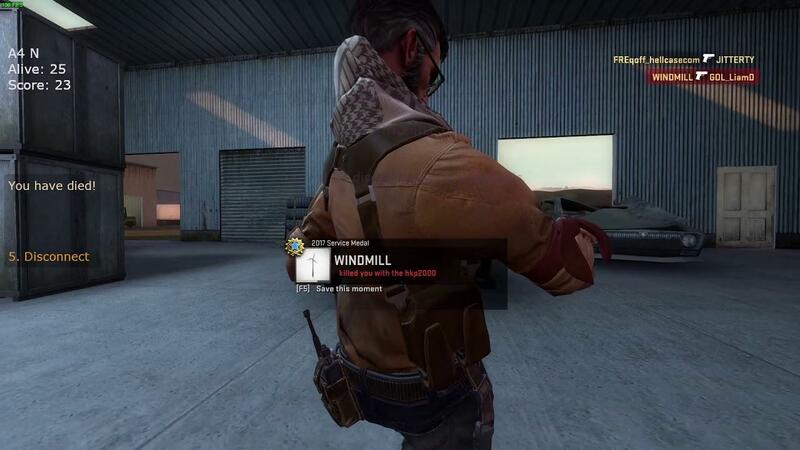 Honestly though, this just makes me really hope the rumour of Valve doing their own PUBG-like mode for CS:GO turns into something official. I don't want to disregard the hard work of this modder and the people who helped, but something more official would be amazing. Do take a look at Go 4 The Kill if you fancy a bit of fun! I think it would be cooler if they could somehow apply this mod to Insurgency, or at least use the weapon models/animations as well as the lean mechanic of insurgency in it. Also, the lack of functional iron sights in CS:GO has been an item of contention for me since Counter-Strike's inception (at least they fixed the wrong mirrored actions of firearms). Granted, I'm glad to see this kind of content come to Linux, I just wish it used more updated mechanics (iron sights and lean, especially). Looks nice. Always thought Running with Rifles would be a really good candidate for a Battle Royale mode. Maybe you would gain AI buddies over time, or for each kill you got. That would be different enough to stand out from the crowd as well. I don't like shooters but if we get PUBG or a CS mod then I will join in. Thanks for the info about the files not downloading.. I tried the game a couple days ago and had the same issue and just gave up on it. Going to try it now.